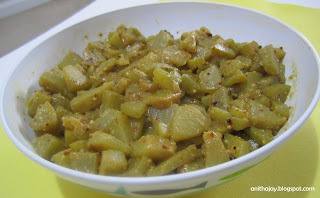 Cook the bottle gourd with water till it becomes soft. In a blender powdered the groundnut and red chili. Mix the groundnut powder with cooked bottle gourd. Heat oil in a pan, add mustard seeds and curry leaves. Once splutter add it the bottle gourd mixture and mix well. Simple and tasty curry is ready. Serve hot with rice. Love this curry with rotis.